Ever wondered why Warren Buffet became so rich? It’s because he truly understands value investing and the fundamentals of company analysis. He is not playing this is a science. The Fundamental Investors or Value Investors like Warren Buffet or Benjamin Graham seek out investments where the risk of the trade is extremely low, due to the large difference between the value of the stock and the underlying fundamentals. 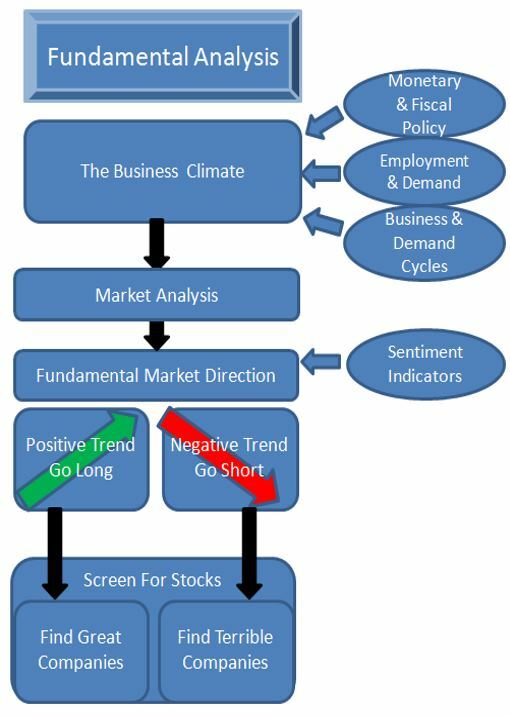 There are also many other critical fundamental factors that play in the stock market. The following image enables you to visualize how this fits together. The effect of Monetary & Fiscal Policy in many ways determines the overall direction of the stock market. They also directly impact employment and demand. Learning about the fundamental impact of governmental economic policy and money supply on the market is very important to your long-term success. From this information, we can assess the long-term market direction. This will enable us, in turn, to adapt our strategy to the market. Once you have established the long-term direction of the market you can decide which companies you will seek to invest in. For example, if the market is in decline you would seek to “go short” on the worst companies in the sector. If the market is in a long-term uptrend you would seek to “go long” on the best companies in the sector. To learn all about Fundamental Analysis, evaluating the market direction and finding great companies I highly recommend the Liberated Stock Trader Pro Training. Next articleWhat are money markets?